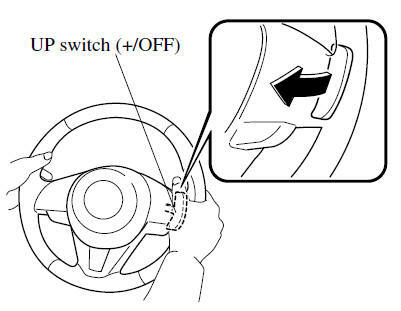 You can shift gears up by operating the selector lever or the steering shift switches (some models).
) toward you once with your fingers. Putting your hands inside the rim of the steering wheel when using the steering shift switches is dangerous. If the driver's air bag were to deploy in a collision, your hands could be impacted causing injury. When driving slowly, the gears may not shift up. Do not drive the vehicle with the tachometer needle in the RED ZONE while in manual shift mode. In addition, manual shift mode switches to automatic shift mode while the accelerator pedal is completely depressed. This function is canceled while the DSC is turned off. However, if the vehicle is continuously driven at a high rpm, the gears may automatically shift up to protect the engine.
) is pulled rearward for a sufficient amount of time.